Don Bailey isn't a Detroiter. He's not a transplant to the area, either. But Bailey, the chairman and CEO of the Denver-based Triton Group, is putting his money on the Motor City. 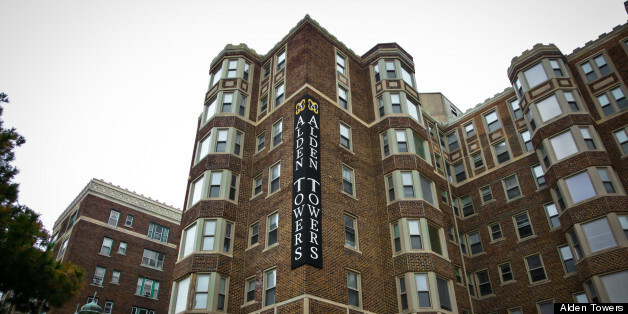 On Thursday, Triton Properties will unveil the first stage of a $5 million renovation of the historic Alden Park Towers at 8100 East Jefferson Ave., which will now be known simply as "Alden Towers." 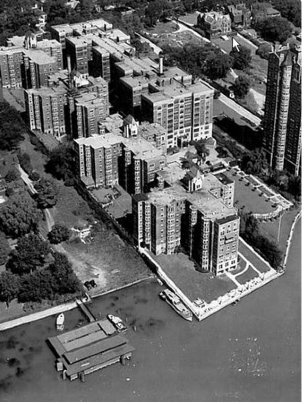 The four red brick towers, lined with grey stone trim, sprawl along part of the Detroit River known as the "Gold Coast" -- an area that's ripe for even more redevelopment. "Detroit is at this great inflection point," Bailey told The Huffington Post. "There's more interest in the city, and there's more competition to buy stuff. We identified Detroit years ago as a city to target for investment." Designed by Edwin Rorke and built in 1923, the Tudor Revival towers had once been majestic. They boast a prominent address and neighbored the homes of Julius Stroh and Edsel Ford. But when Triton Properties purchased the foreclosed property for $2 million from the Anglo Irish Bank in August of last year, they found the historic building trashed and in disrepair. Certainly, no one could call Alden Park Towers a turnkey property: squatters had overtaken portions of the building, according to a report from WJBK-TV. Rooms were littered with garbage. The previous owner had racked up 23 current citations with the city of Detroit at the time Triton purchased the property. Apartment reviews found online give a bleak picture of life at Alden before the foreclosure. "This apartment complex is the saddest excuse for living I have ever seen," wrote one reviewer on apartmentratings.com. Warned another, "Someone stole my bed while I was moving." "To give you a picture of what was going on," Bailey said, "seven out of eight elevators in the building weren't working." But Bailey, whose company specializes in rescuing and renovating distressed, often historic, apartment units, wasn't fazed: He affectionately refers to the building as their "latest adventure." After the purchase, Triton embarked on a furious 24-month renovation project across all four towers. Month-to-month leases (those that expired and rolled over) were terminated in late February. Residents were asked to reapply for new leases through the property's new management company, KMG Prestige. The first phase of construction, open to visitors on Thursday, has revamped most of the property's common areas, along with units for rent in Tower A, which faces Jefferson. Construction is expected to continue for another 18 months while the building continues to lease out newly renovated units. "Detroit was gridlocked with an abundance of negative press with the voluminous coverage of the city government scandals," Darralyn Bowers, a realtor and owner of Bowers & Associates in Southfield, told The Huffington Post. "Once that was resolved, new interest has been kindled in Detroit, as one of the cities with the greatest potential in the United States." Despite the presence of an emergency manager, Bailey says he's seen the City of Detroit as a partner, both in the Alden Park rehab and his earlier projects, which included renovating and leasing out nine homes in East English Village, along with leasing 130 units in the Harbortown condo complex. "Our interactions have mostly been taking care of all of these citations and permits, and they've generally been quite good," he said. "They're happy that someone came in here to do this ... the reality is, they've been quite easy to work with." Bailey added that Alden Towers didn't receive any tax credits or grants from the city. With tales of 95 percent occupancy rates in Midtown residential buildings, new projects and double-digit increases in property values in some areas, the development race is on. "Investors are purchasing investments at a rapid pace to seize these opportunities and benefit from the "ride up" that is expected in property values," Bowers said. Bailey says he's been unsuccessful this far in acquiring properties in Midtown and downtown proper, but says he isn't regretful. "I think downtown has few residential opportunities unless you do a major renovation of business towers into residential," he said. Bowers said the Gold Coast, where Bailey's development is leading the charge, is an area primed for more investment. "The Jefferson Corridor is seeing rapid growth with projects in planning and underway," said Bowers. "The Detroit River is the attraction for the Gold Coast. No other area can compete with the beauty of that setting." Along the Detroit River and Jefferson, more work continues, like constructing the final stretch of the 3.5 mile East RiverWalk and redevelopment of the Uniroyal site. Other nearby projects include a senior living community headed to Rivertown and the transformation of the historic Globe building into a discovery center. Bailey said Triton Properties will continue to focus on the Jefferson Corridor. "Once we buy a building, we generally look at it as that we've bought it for a lifetime," he said. "And that's the way we feel about Detroit, too. We're invested here for the long-term." While the public can first see the Alden Towers' makeover on Thursday, 60 new residents are already experiencing the building's new look and feel. Triton tapped Detroit architectural firm Kraemer Design Group to ensure that construction adhered to historic preservation certifications. They brought in Sharon Carlile of Royal Oak furniture shop Italmoda to consult on the "boutique hotel lobby feel" of the upgraded common areas. Residents lounging on the design-forward furniture will enjoy free Wi-Fi throughout the building, as well as a new fitness center, upgraded laundry facilities and remodeled underground parking garage. "The hardwood floors, the architectural design ... we just really wanted to restore this building to all of its former greatness," Bailey told The Huffington Post. That means completely renovated new one- and two-bedroom apartments, ranging from 650 to 1,180 square feet in size, all priced between $649 and $1134 per month. Whenever possible, contractors preserved the building's hardwood floors, original moldings and tile. But every unit now has brand-new energy-efficient appliances, cabinets, countertops, faucets and furnishings. A concierge program offering services like dry-cleaning and grocery delivery from local services is also in the works. "We're hoping we can be a destination to some of the people moving downtown who want to be part of Detroit's future," Bailey said. For more information, call (313) 824-1310 or visit aldentowers.com.